Thank you, Mom and Dad, for my new best friend. Although Evan and I have only had this beauty for less than two days, we have already used it to make coffee, a chai latte, and hot chocolate. 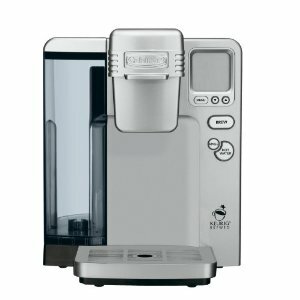 It all took about a minute, which is one of the reasons why the Cuisinart SS-700 Single Serve Brewing System is my new best friend. We still have some Dunkin Donuts coffee left, but that’s not a problem. It came with something that allows us to use the left over coffee in our new machine. We haven’t done it yet, but when we do, we will let you know how it turned out. We found the cheapest cups to be at Bed Bath and Beyond when you use their 20% off coupons. They had a pretty decent selection. Otherwise, Amazon.com is cheapest and they have the widest variety. This entry was posted in Utensils. Bookmark the permalink.